I recently started reading Inferno by Dan Brown and having a very hard time putting it down. It stays true to the fast paced kind of scavenger hunt rhythm with which Brown is known for. It forces readers to think and move along with Professor Robert Langdon as he traverse the streets of Italy trying to solve the mystery wrapped in a series of clues based on the famed poet, Dante Aligheri. Below Colline did a review of the book and I thought I would share her thoughts here. My full review will be posted as soon as I’ve completed the novel. 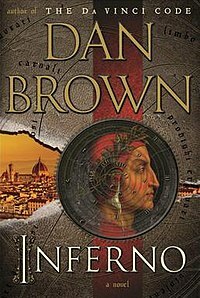 I enjoyed reading The Da Vinci Code, Angels and Demons, and The Lost Symbol so when Dan Brown’s most recent novel, Inferno, came out I knew I had to read it. As soon as I got my hands on a copy, I found a moment to sit down on my sofa and open the book. From the first sentence in the prologue, Brown’s story drew me in. I had questions after reading the prologue and, curiosity roused, I turned the pages eager to know more. I read that Langdon wakes up in a hospital with amnesia with no recall of how he arrived there. He comes to the realisation that he is in Florence – and does not know why. Suddenly he is being shot at and escapes with the help of Sienna Brooks, a woman who appears to be a medical intern.